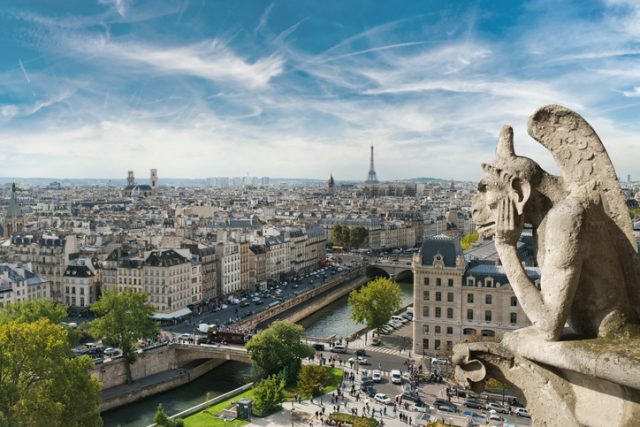 Notre Dame Cathedral has towered over Paris since its completion in the 1250s (the flying buttresses were added in the 14th century). 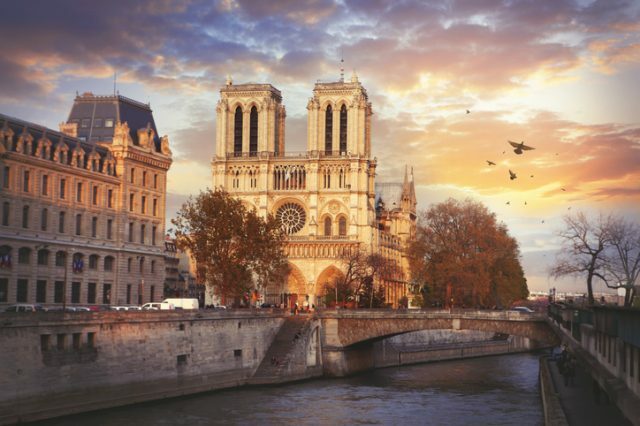 It is one of the most beautiful Gothic cathedrals in the world, situated at the heart of arguably one of the most beautiful cities in the world. But it is not only the incredible architecture and enormous stained glass windows that make it fascinating. 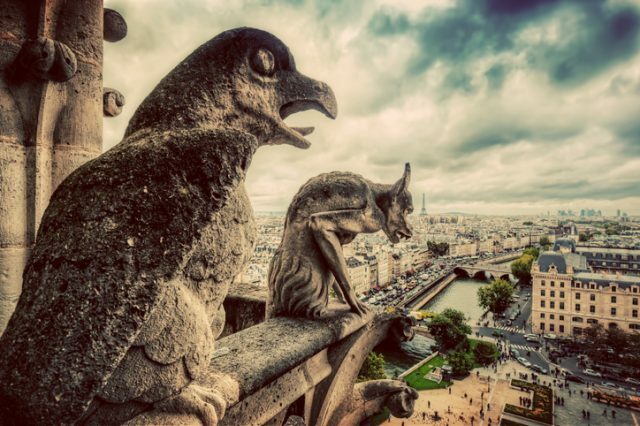 Notre Dame is also covered with some fantastic and stunning beasts: gargoyles. 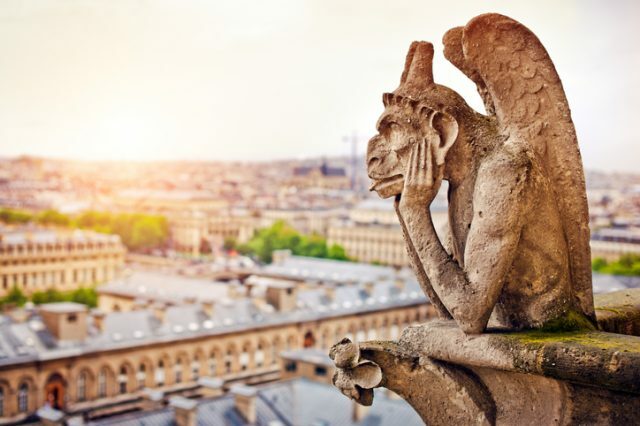 By definition, a gargoyle is a carved or sculpted mythical figure, usually designed with a spout of some sort that carries water away from the building, just like drainpipes do on modern houses. How far the water spurts from the building depends entirely on how far the gargoyle projects out. The term comes from the French, gargouille, which means throat or gullet. This makes sense considering that water usually comes from a gargoyle’s mouth. There is also a French legend from the Rouen area in which a creature called la Gargouille looked like a dragon, with a long neck, bat-like wings, and the ability to breathe fire. There are various versions of the legend, but essentially St. Romanus conquers the Gargouille with his crucifix, and brings it back to Rouen to be burned, except that its head and neck, having been tempered by its own fire, remain intact, and are then mounted on the walls of the new church to keep away evil spirits. Gargoyles and other mythical creatures also represented and illustrated evil in the medieval Catholic Church. The Gothic idea of a damned afterlife is one of pain and suffering, and the gargoyles can be said to represent the demons outside versus the sanctity and safety of the church inside. A gargoyle in Notre Dame’s Cathedral in Paris, France. 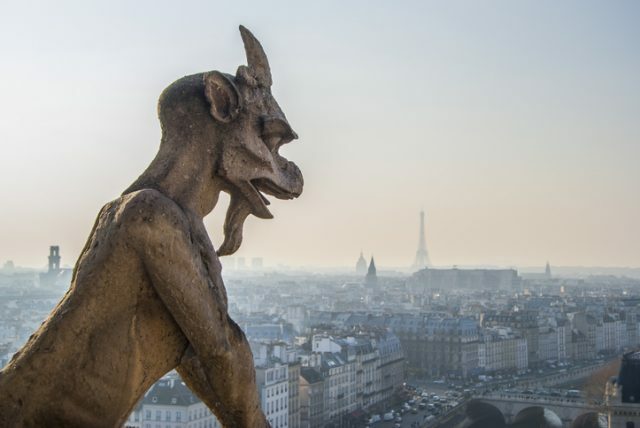 The gargoyles and grotesques of Notre Dame, of which there are hundreds, are particularly stunning, and they have been keeping rainwater and evil spirits away from the church since the 13th century. Some of them look positively ferocious, while others are elegant, and some even look a bit bored. Several are not even true gargoyles at all. 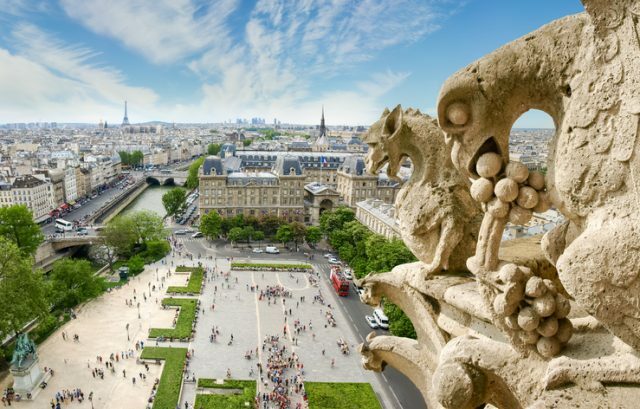 In fact, the creatures that adorn Notre Dame cathedral are made up of various types of fantastical beasts, including: chimera, which are ornamental only and serve no real function; grotesques, which are carvings that may or may not carry water; a wyvern, which is a small 2-footed dragon; and the Styrga, often referred to as the “spitting gargoyle” and one of the most famous figures on the cathedral. 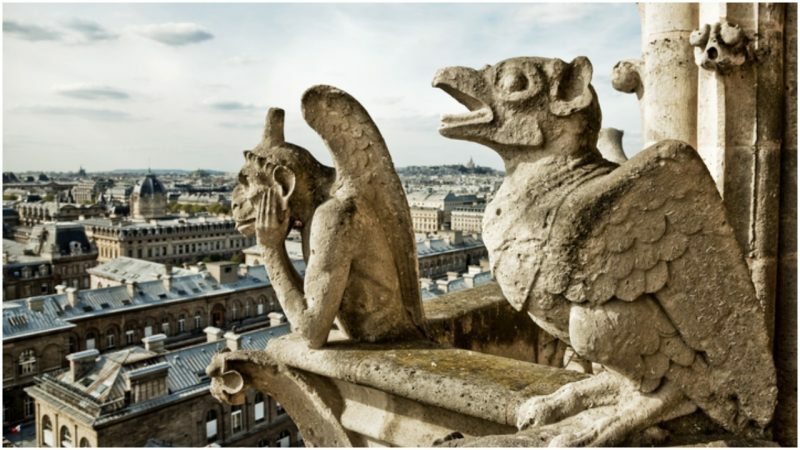 While the true gargoyles were prone to erosion from the very rainwater they were designed to carry away from the cathedral, many other figures were removed or destroyed in the 17th and 18th centuries, particularly during the French Revolution. 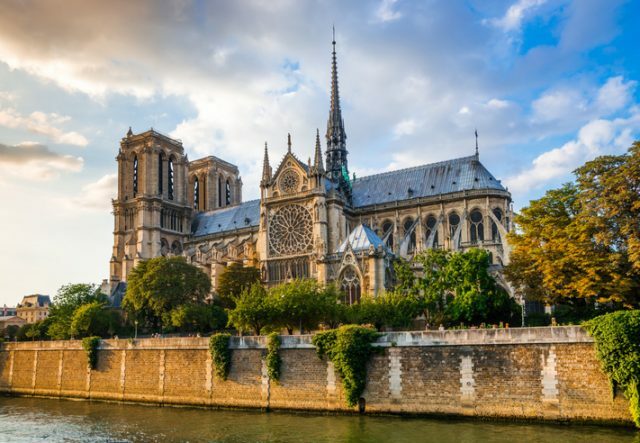 They were later replaced in the Gothic style by the French architect Eugène Emmanuel Viollet-le-Duc during his 25-year restoration of Notre Dame in the mid-1800s. As was not uncommon among earlier medieval church builders, Viollet-le-Duc added a figure of himself as one of the new gargoyles. 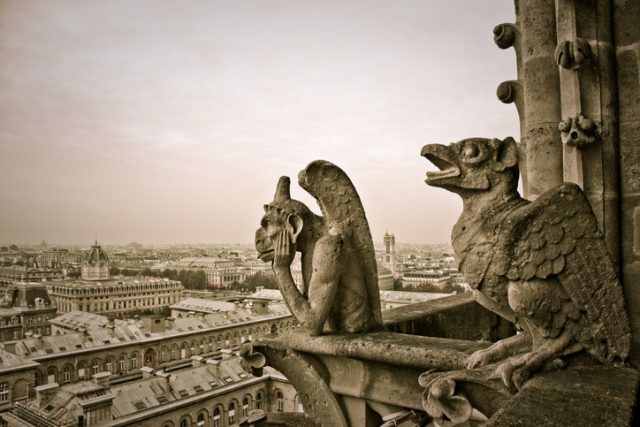 Devil, dog, heron, and grotesque gargoyles of Notre Dame. Of all of the figures on the cathedral, the Styrga is perhaps the most photographed. Also called the Strix, it was added along with many other chimeras as part of Viollet-le-Duc’s restoration and resembles a bat or perhaps an owl, with a large head, a voracious beak, wings, and horns. Monochrome photograph of the Cathedral of Paris with gargoyles. Some of the other intriguing figures on the cathedral include a Heron, with gently folded wings and a long beak facing downwards, as if perhaps in prayer, a serious looking elephant, goats, a ferocious monkey, and a three-headed dog, not to mention a wild boar, several eagles, a chimera eating grapes, and a demon gnawing on a human soul. 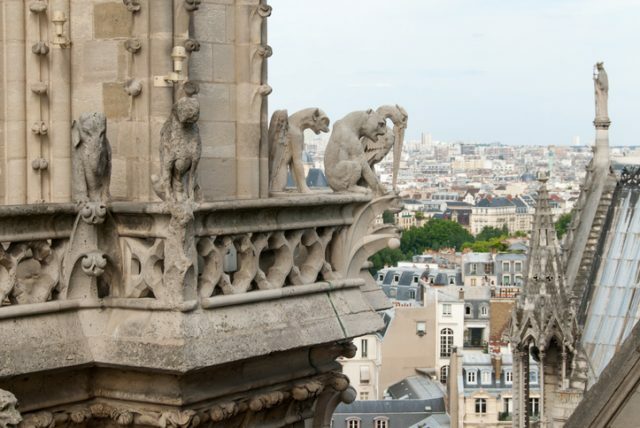 The gargoyles and figures of Notre Dame have inspired many artists and writers, including the famous French author Victor Hugo, who gave the cathedral’s gargoyles a prominent role in his work The Hunchback of Notre Dame, which allegedly was written as a means to draw attention to the crumbling cathedral and inspire the restoration of the great structure. Read another story from us: Why is the Creature from ‘Alien’ on a 12th century Abbey? 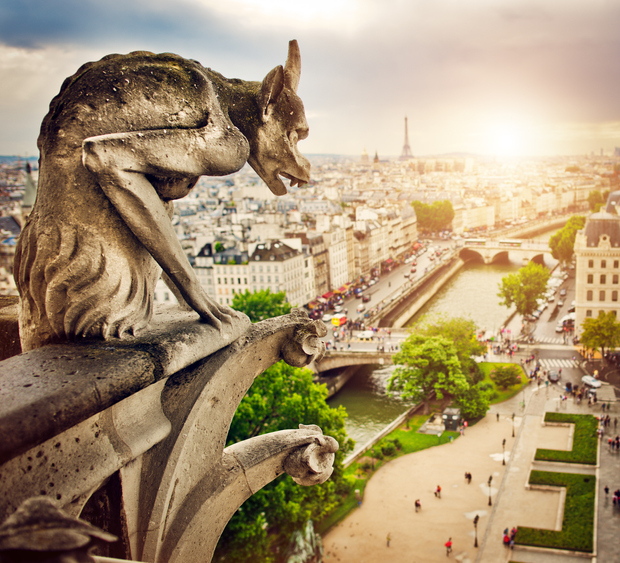 Fittingly, if you visit the cathedral of Notre Dame, the best place to see the gargoyles and chimera is by climbing the bell towers.